Pakistan's general elections are scheduled for July 25. Journalists covering the election may face intimidation or physical aggression, especially when covering political rallies and protests, and the possibility of terrorist attacks. In May, the Pakistan-based media watchdog Freedom Network documented 23 violations against the media. Journalists are also at risk of abduction or increased online abuse and trolling. Journalists working in Pakistan are encouraged to report attacks or violations to the independent Pakistan Press Foundation's election monitoring mechanism. A report of each attack will be brought to the notice of the Election Commission of Pakistan's relevant federal, provincial and local authorities. The mechanism can be contacted via [email protected], mobile or WhatsApp at 033-633-29872 or Twitter @attacksonmedia. Plan the assignment and ensure that you have a full battery on your cell phone. Know the area you are going to. Work out in advance what you would do in an emergency. Mobile and 3G communication may be poor or completely absent in regions where political rallies are held, as well as during long stretches of the route, especially in rural areas. It is advisable to take a satellite phone when traveling to these regions. Always try to work with a colleague and have a regular check-in procedure with your base--particularly when covering rallies or crowd events. Consider your position. If you can, find an elevated position that might offer greater safety. Maintain situational awareness at all times and limit valuables. Do not leave equipment in vehicles. After dark, the criminal risk increases. If working in a crowd, plan a strategy. It is sensible to keep to the outside and avoid getting sucked into the middle where it is harder to escape. Identify an escape route and have a team emergency meeting point. Keep eye contact with an aggressor, use open hand gestures and keep talking in a calm manner. While documenting aggression can sometimes be crucial journalistic work, be aware of the situation and your safety. Taking pictures of aggressive individuals can escalate a situation. Always ensure that you have the correct personal protective equipment for the situation. Never become so focused on your work that you lose situational awareness. Events can happen very quickly, and the mood of a crowd can change in an instant. Remain alert and prepared to move at all times. Keep in mind that first responders, including the media, are popular targets for terrorists and that secondary attacks must be factored in at all times. In those situations, your positioning can be crucial to your safety. Remaining indefinitely at the unsecured scene of an attack can put you in danger of being the victim of a follow up attack. Minimize time at the scene before pulling back to a safe distance. During a marauding attack, the key is to remain mobile. You should always assess every location you find yourself in and identify exits and refuges in case the situation turns. Avoid lingering in close proximity to large glass windows and wooden or damaged infrastructure. If there is a secondary explosion, glass shards, wooden splinters and debris can kill. Crowds can pose a threat to journalists reporting on an attack. Try to remain on the edge of crowds, and be aware that they can turn hostile. Consider the safety of any live positions or stand up locations for broadcast. If members of the public can access the locations easily, then there is a risk of an emotional/aggressive individual disrupting and even harming you. If operating at night, be aware the risk can be heightened as security forces and members of the public can be more jumpy. Do not take your cue from other journalists who may have a different tolerance for risk. Always use your own judgment regarding risk. While at times there can be safety in numbers, it can also lead to a false sense of security. Review your social media accounts regularly for trolling activity. You should be extra vigilant after publishing stories that might attract trolls. You can protect your accounts from hacking by creating long and strong passwords and by turning on 2-factor verification. Review your privacy settings and make sure any information that you do not want available to the public is either hidden or removed. During a trolling attack, journalists should try not to engage with the trolls as this can make the situation worse. Journalists should report any abusive or threatening behavior to the social media company. They should also document any comments or images that are of concern, including screenshots of the trolling, the time, the date, and the social media handle of the troll. Look at the type of trolling and try and ascertain who is behind it. Look to see if the trolls are real people or bots. You may want to block or mute trolls. You should report any trolls that are abusive or threatening to the social media company. Change the settings on Twitter to control the content you see on your feed. See the Troll Buster guide for more information. If trolling involves defamation of your character and/or your work consider mobilizing a team of supporters on social media to counteract the claim. You may want to consider going offline if an attack is particularly bad. Consider making your employer aware of the situation. Document the attack. 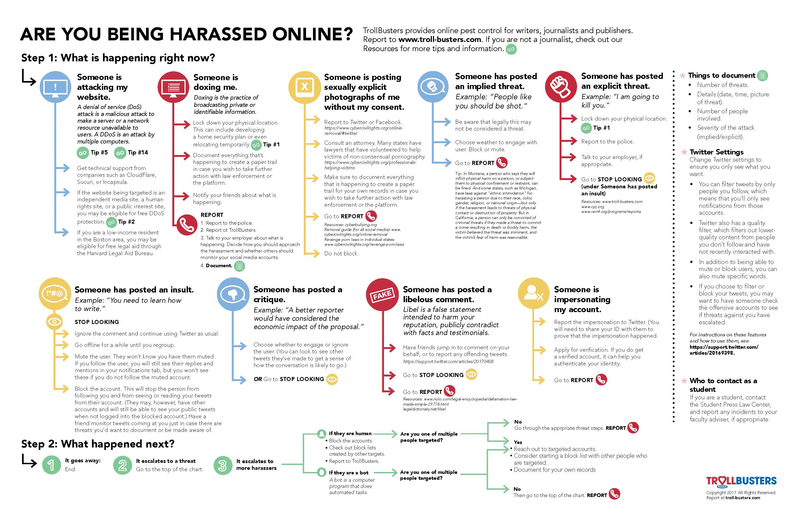 See the Troll Buster guide to harassment online for how to do this. Foreign journalists planning to travel to Pakistan for the election should consult the Code of Conduct for International Media published by the Election Commission of Pakistan. CPJ's Journalist Security Guide has additional information on basic preparedness, assessing and responding to risk, or safety measures when covering civil conflict and disturbances. CPJ's resource center has additional information and tools for pre-assignment preparation and post-incident assistance.